"The praise makes me feel uncomfortable and even irritated when I hear it. The hero of the Occupy movement is every single Hong Kong citizen." 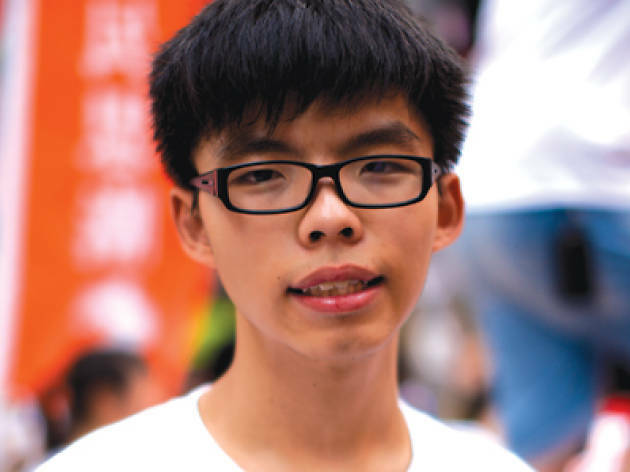 Joshua Wong turned 18 on October 13. Being old enough to drink and cast a vote is a milestone that most teenagers celebrate by buying a round or enjoying a family dinner. Joshua Wong, however, isn’t most teenagers. The often black T-shirt-clad and bespectacled student activist celebrated by giving a press briefing in Admiralty amid throngs of reporters and protestors. Shortly after midnight, he updated his Facebook page with three birthday wishes. Firstly, he wished peace for his girlfriend, family and fellow Occupy activists. Secondly, for the Occupy movement to retain the determination to continue its fight. Lastly, he wished for Beijing to revoke its decision on Hong Kong’s 2017 Chief Executive elections. Wong’s articulate, precocious wishes exemplify his belief that peaceful civil disobedience can evoke change. 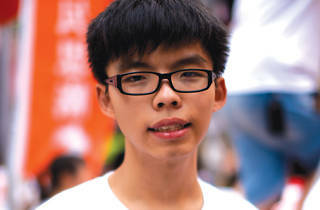 Wong was 15 when he convened student movement Scholarism, which campaigned against plans to introduce compulsory Moral and National Education, catalysing 100,000 people to march in the streets in 2012, before leading a sit-in at Tamar. “We’ve been driven up the wall by the government,” the 15-year-old Wong told us in August 2012, during the furore. “But we haven’t given up hope. We just don’t want to see our next generation become puppets and lose their freedom.” On the day before the decision was due, CY Leung announced a U-turn over the proposed curriculum, and Wong became synonymous with the potential power of civil disobedience. In September this year, Scholarism, along with other student groups, led another sit-in at Civic Square. This time, the goal was universal suffrage. Wong and others were arrested and detained for 40 hours. This was the dramatic catalyst for Benny Tai's announcement that Occupy Central had begun. We meet Wong in Admiralty a few days after his birthday. He’s just given his umpteenth rallying speech, this one on the subject of police violence. Passionately engaged, microphone in hand, he shows no signs of tiredness – although he admits he wants dinner. It’s been a steep ascent into the spotlight for Wong. Born in 1996, a crucial time in Hong Kong’s evolution, Wong says his middle-class parents Grace and Roger took him to protests as a child, fuelling his interest in politics. He says they are not ‘helicopter’ parents and have given him freedom to take part in Scholarism – a luxury not all its members enjoy. Interest in Wong is now so high that in August he and Scholarism spokesperson Agnes Chow Ting even announced their university exam results at a press conference. Wong has alleged that, during a recent graduation trip to Taiwan, he was followed and photographed by a man who’d been commissioned by a ‘company’ to watch him. Wong has regularly warned of the dangers of social movements focusing on one person, and coyly refuses to acknowledge himself as the public face of Occupy. In September he wrote a short essay on his Facebook page, deploring people who call him a hero. ‘[The praise makes me] feel uncomfortable and even irritated when I hear [it]…’ he wrote. ‘The hero of the movement is every single Hong Kong citizen’. Wong turned 18 under remarkable circumstances, but an hour after the press briefing he shared a cake with a small group of friends and fellow Scholarism members amid the tents and banners of Occupy. An ordinary moment in what is, and will continue to be, the extraordinary life of this Hong Kong teenager. Anna Cummins. Additional reporting by Ysabelle Cheung. Find out more about Scholarism at fb.com/scholarism.